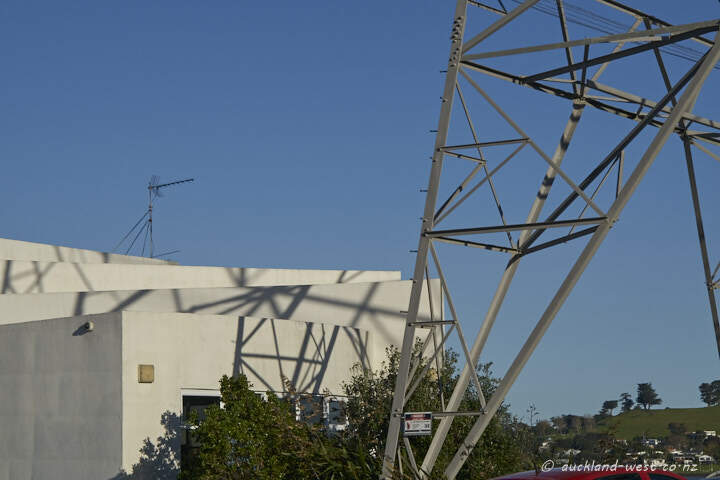 Do not climb (the pylon, that is; it is pylon 32 on Line A between Otahuhu to Henderson). More importantly: clear blue sky with a promise of (so far) the coldest night to come (3 degrees C expected). In the background right: Mangere Mountain, one of our volcanic hills. 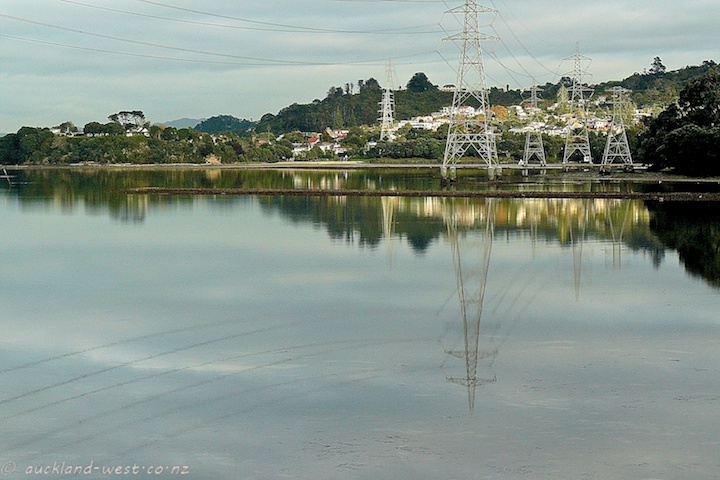 Manukau Cruising Club in the foreground. 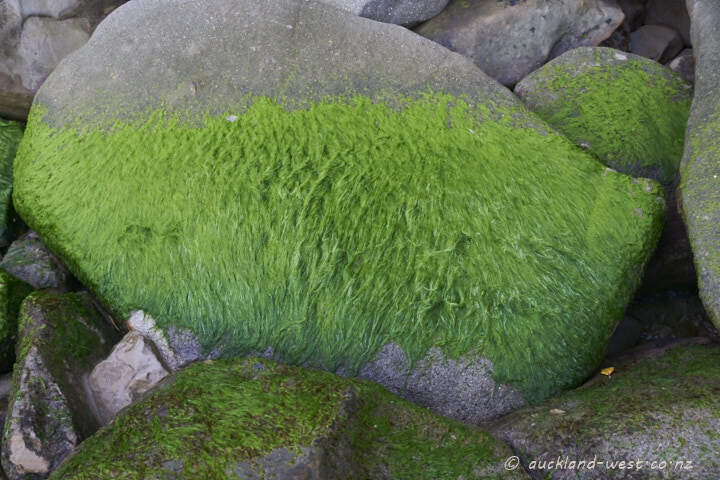 This rock in Jenkins Bay, South Titirangi, has grown a fine winter coat. 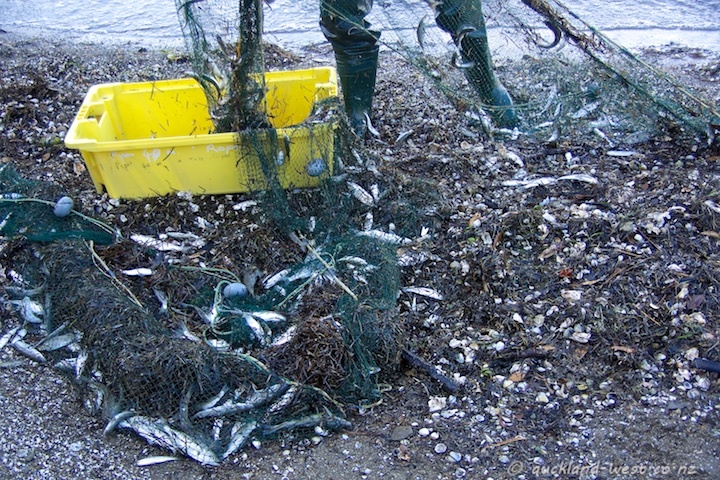 Catching sprat (and a lot of seaweed) for bait at Mill Bay. 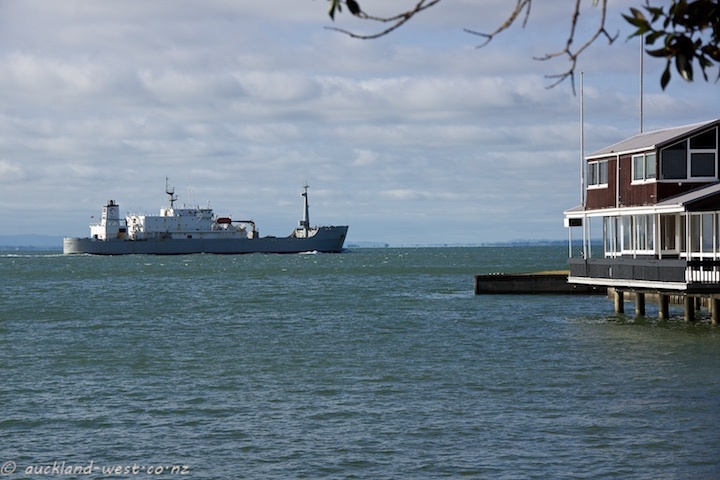 The Milburn Carrier II has delivered its load of cement and is on the way back to the South Island. High tide is needed to negotiate the channel. 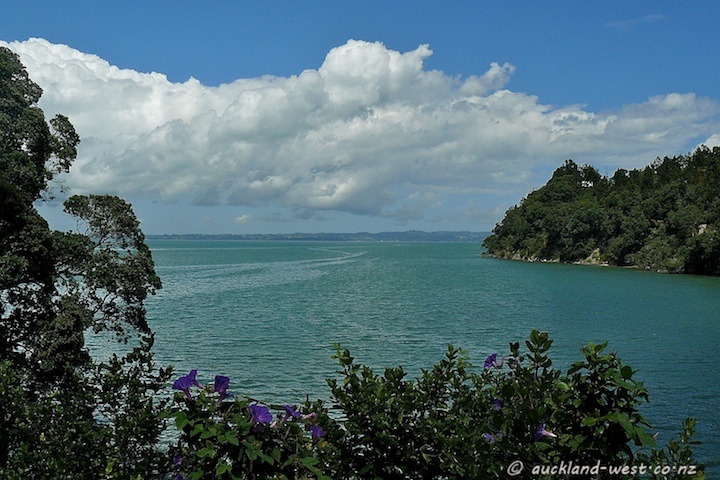 The Manukau Harbour – opening from the Auckland Isthmus to the Tasman Sea – is too shallow for modern shipping. Its main use these days is to deliver cement from the South Island. 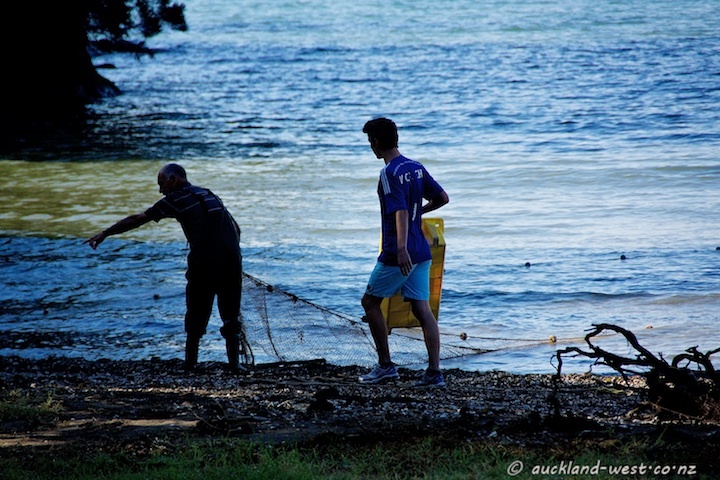 By the end of next year these deliveries will also go to the Port of Auckland (on the other side of the isthmus), gfreeing up Onehunga wharf for more recreational use. 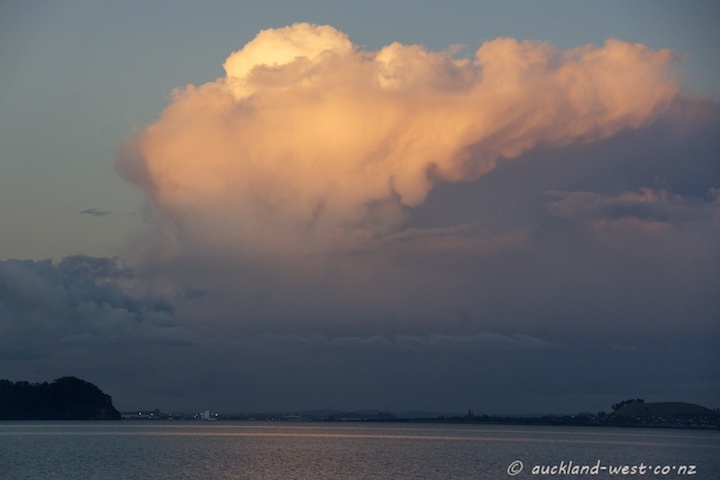 A big cloud towers over the Manukau Harbour, catching the last light of the setting sun. As the Low disappeared in the east, a chilly night ensued, followed by a crisp but sunny day. French Bay. 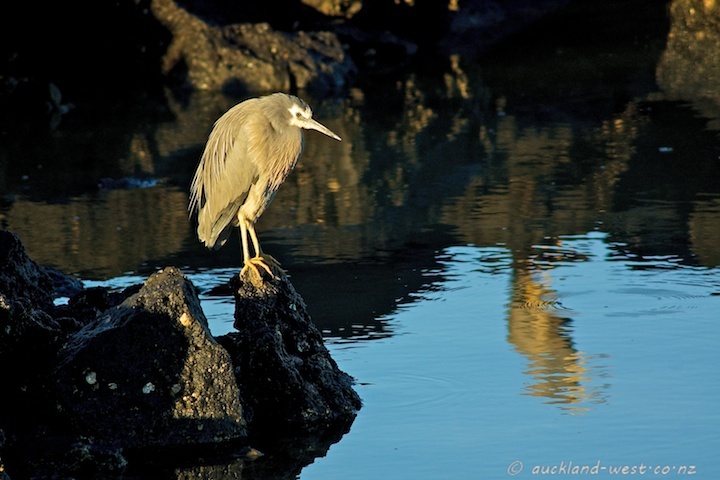 Like a wise old man deep in thought, this white-faced heron may well ponder the case of the disconnected reflection. 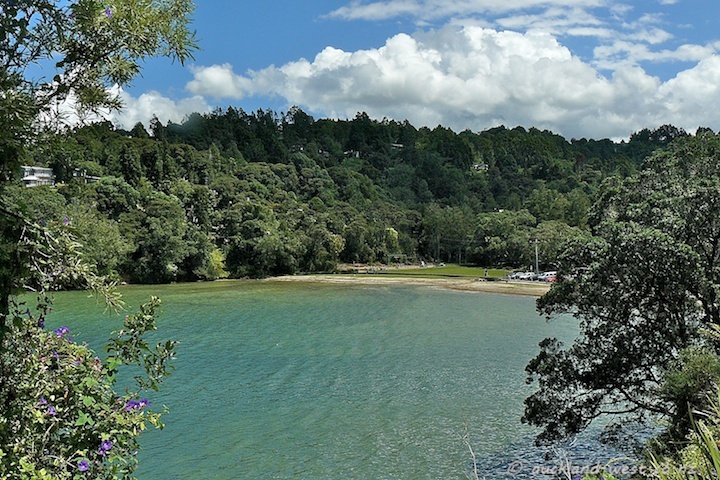 The narrow and windy Titirangi Beach Road leads down to this charming Bay on the Manukau Harbour. 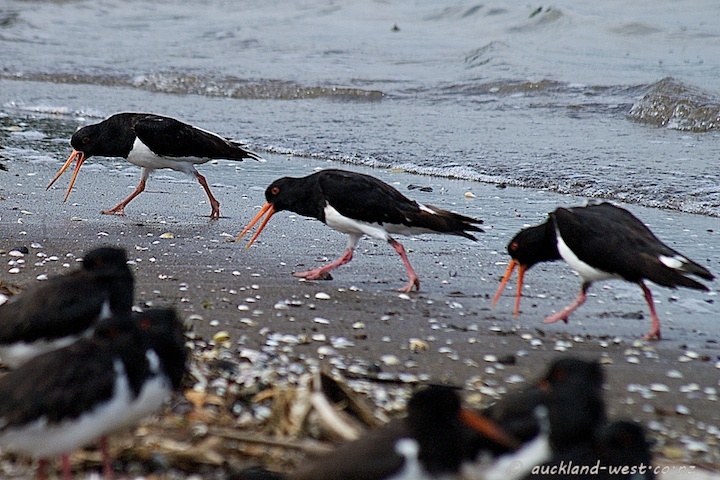 When the tide comes in, oystercatchers leave their feeding grounds in the mudflats of the Manukau Harbour to rest and roost on the shore. Most of the time there is no action beyond a bit of shuffling about, but now and then there are shrill and excited noises, often accompanying a curious dance-like behaviour. Could be a bird on its own, mostly two of them, and here we have a group of three goose-stepping along the water’s edge. South Island Pied Oystercatcher (Haematopus finschi) at Huia. This was the view towards Southwest when we were up on Mt Donald McLean recently. 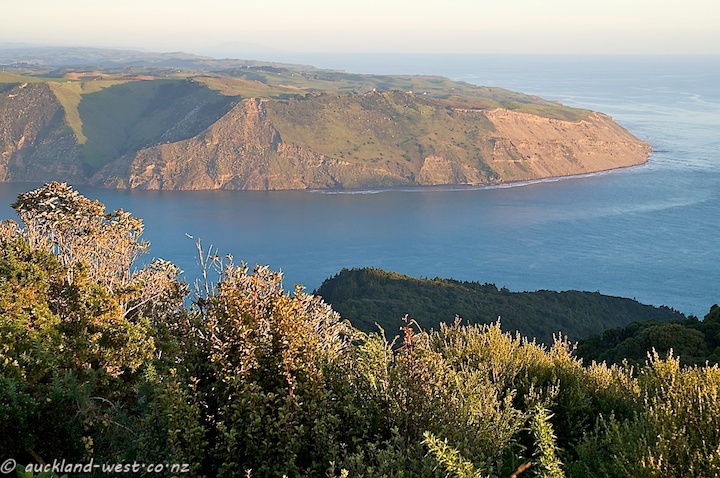 The soft light of the evening envelops the southern shores of the entrance to the Manukau Harbour, with the lighthouse on top of the Manukau Heads faintly visible on the ridge.